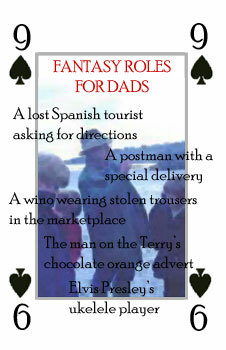 I created fantasy roles for dad, because I didn't want to confront what he had really become. I told my friends he was an out-of-work actor. In order to keep his hand in when work was slow - I told them - dad would dress up as odd quirky characters, and then ambush me wherever I happened to be in the world, hoping to fool me with his disguise. In most cases I would recognise him instantly, but I pleaded with my friends to go along with the charade so as not to break his spirit. A lot of my friends believed this story for a long time. When I returned from the cremation, one of them asked me: So did you recognise him?